Case Study: AgSolver, an Iowa-based company, helps producers shift to perennial grass production using software tools that assess crop potential and profitability. Not all cropland can profitably grow crops such as corn and soybeans. Even with the help of the newest technologies, farmers don’t necessarily make money—or reap other benefits—from all parts of their fields. AgSolver’s Field Report Card for Muth Stock Farms. Photo:AgSolver. One of the goals of AgSolver, an Iowa-based company, is to help producers make better business decisions by determining which sections of a field (or subfields) make money consistently generate income by growing commodity crops and which could be put to more profitable uses, such as bioenergy crops, or simply left out of crop production. Those alternative uses may also provide ecosystem services that benefit the public. There are more than 2 million acres of commodity crops in Iowa alone that are consistently unprofitable, says David Muth, senior vice president of analytics for AgSolver. Muth’s company, unlike those which deliver only agronomic data, offers “decision services” to help farmers make good business decisions about farmland use. These software services employ a wide range of public and private data to analyze a farm’s production in depth and choose the best use for the land. Technological advances in smartphones, satellites, and drones are spurring the capture of vast amounts of high-resolution data for agricultural use. Such data can describe in detail the topography, slope, organic matter, drainage, erosion potential, and productive capacity that make up a farm field, especially the large fields that many farmers manage today. 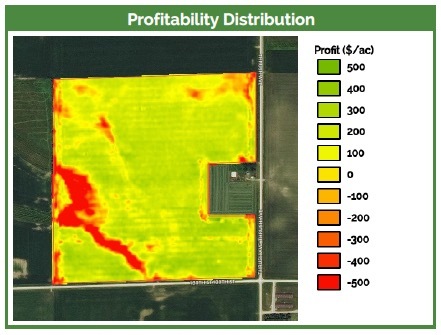 AgSolver’s Profitability Distribution in a 145 acre field for Muth Stock Farms. Photo:AgSolver. For producers considering growing bioenergy crops, AgSolver’s Profit Zone Manager can be especially useful. 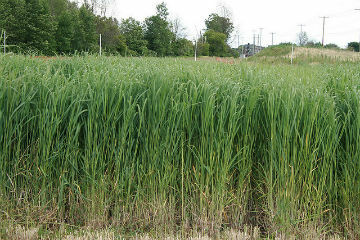 The application demonstrates which subfields—profit zones—are not profitable; those that don’t merit high input costs could be shifted into less-intensive bioenergy crops such as perennial grasses. Subfield management offers environmental benefits, too, such as decreasednutrient applications and runoff. Subfields can also be put into conservation or planted to vegetation that furnishes ecosystem services (e.g. wildlife habitat, pollinator habitat, water quality, landscape biodiversity, recreation) that provide public benefits as outlined by the United Nations’ Millennium Ecosystem Assessment. 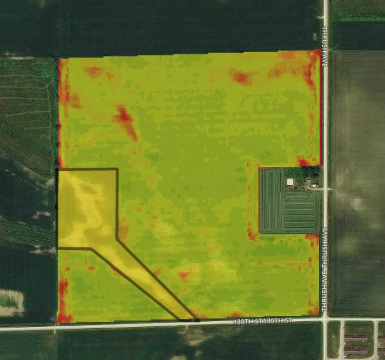 AgSolver selected 15 acres for perennial pollinator habitat (yellow) in this 145 acre field, to provide ecosystem services and favorable ROI. Photo:AgSolver. Muth, who grew up on an Iowa farm, headed a research team at the US Department of Energy’s Idaho National Laboratory, working on production of bioenergy feedstocks and logistics. He brought that experience with computer modeling and data analysis when he started AgSolver in 2013. Now he has an excellent laboratory—his father’s farm in Iowa. The farm, typically planted to corn, has a 145-acre field which includes 15 acres of sandy, poor-performing soils. Muth uses the Profit Zone Manager tool to show that, by managing this 15-acre profit zone separately, as part of the Natural Resource Conservation Service’s Conservation Reserve Program initiative that promotes pollinators, his father can boost his profit by $35 per acre for the entire field, with return on investment (ROI) by more than 5 percent. ROI–the profit a farmer makes for each dollar of input–is the key, Muth says. 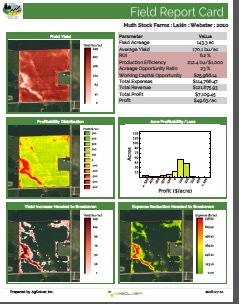 AgSolver focuses on that business factor rather than just maximizing revenue from a field based on agronomic data. But can a farmer accurately and profitably manage a field at such a small scale, in an agriculture where large fields worked by enormous equipment is becoming the norm? That could mean implementing practices that use fewer inputs—decreasing the nitrogen (N) rate, say, or the seeding rate, on certain areas. A farmer may have to use a 36-row planter but he can still control the seeding rate. Profit Zone Manager can also help him answer questions such as whether to invest in a variable rate seeder or how much cash rent to pay for that piece of land. AgSolver offers other services useful to bioenergy crop producers, such as the Sustainable Residue Calculator that helps producers decide how much corn stover can be harvested sustainably. By focusing on business planning, AgSolver is breaking ground in the use of precision data in agriculture. Producers have yet to buy into the use of precision data on a large scale, and rightly so, Muth says. Better data doesn’t necessarily mean better decisions. “We’ve been chasing agronomic info and big data, but only 15 to 20 percent of acres are paying for that kind of services and it’s not clear that farmers are getting an ROI,” he said. With AgSolver, Muth wants to show producers precisely what kind of ROI they can earn from their land and how to do it, helping them make more profit, while defining opportunities to profitably grow bioenergy crops and to provide ecosystem services.